As I was experimenting with my new camera and my new lighting set, almost necessary when taking pictures of food after dark, my camera quit on me. Disappointed that I would not be able to share this pasta recipe with you, I turned to my extraordinary iPhone and asked Siri what to do. Use me! She said. These pics turned out great! This machine is awesome. These lights are not so bad either, are they? I just got them and I am still playing with them, trying to learn about food photography, but I am quite happy with the result. In this dish, your broccoli needs to be very, very cooked, overcooked in fact. It will become mushy and this is what will create the sauce. You do not want the crispy-bright-green-stir-fry broccoli here. Also, the parmesan is not just a garnish, it is an ingredient. The dish does not work otherwise. Of course, you can use hot italian sausage and omit the chili pepper. Remember, this pasta will be as good as the sausage you use. 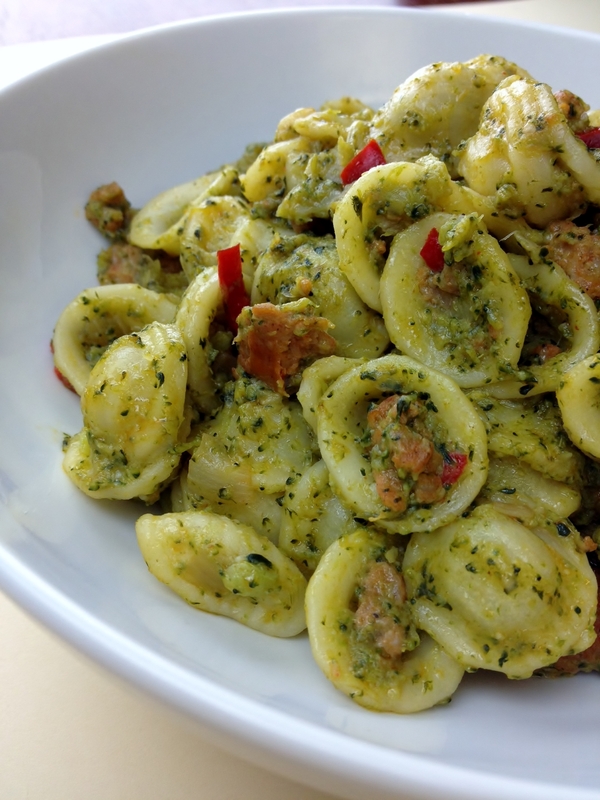 If you don’t have orecchiette (little ears), any short pasta will do. 1. Start by cooking the broccoli in salted boiling water until soft. It has to be a bit overcooked. 2. While the broccoli is cooking, put the olive oil in a large frying pan over medium heat. Cook the shallots until soft, a few minutes. Add the garlic and the chilies and cook for one more minute. 3. Drain the overcooked broccoli and add it to the pan with the onions, garlic and chilies. Cook for about 5 minutes until combined, mashing the broccoli as you go along. 4. Toss the broccoli mixture on one side of the pan and cook the sausage on the other side in a bit of olive oil. When the sausage is almost cooked through, mix everything together. Turn the heat to low and cover. 5. Cook your pasta in the same water you cooked the broccoli in for one minute less than indicated on the package. Before draining the pasta, reserve 1/2 cup of cooking water. Drain the pasta and add it to the pan with the broccoli and sausage. 6. Raise the heat to medium and add the reserved cooking water. Stir everything together for one minute. Turn the heat off and add the cheese. Taste and adjust seasonings. 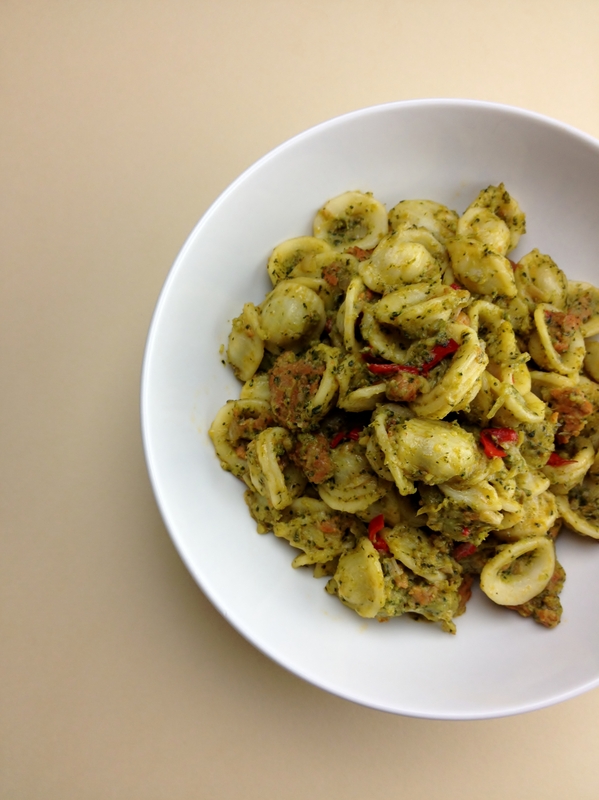 Transfer to individual bowls, drizzle a bit of good olive oil over the pasta and pass more cheese at the table. Moist is my word du jour! I overcook broccoli more than I like to admit so this is perfect for me. Also it looks awesome. Italians seem to like overcooked vegetables in general. I like it too and it works well here. Also, hope you don’t mind. I just pinned this, so I won’t forget it! I am not sure wether I should blush or thank you… I don’t know what a pin is. Please, explain. That woman is a saint. Looks delicious! What kind of lighting set do you use? I’ve been thinking about getting one as the quality of my pictures is often pretty bad if we eat dinner later! I use http://www.henrys.com/60039-ERIN-MANNING-HOME-STUDIO-KIT.aspx. These were shot around 9PM. Not bad I find! Thanks! Yeah, I’d never have guessed you shot them at 9 PM!